Intended for quick wheel free maintenance while providing ample work space with our open floor design. The most versatile and user-friendly platform solution to undercarriage repairs and wheel service maintenance. Heavy Duty Mobile Front & Rear Truck Axle Lifting Solutions Designed For Quick Wheel & Drivetrain Service. Designed To Virtually Lift Any Vehicle, Anywhere. 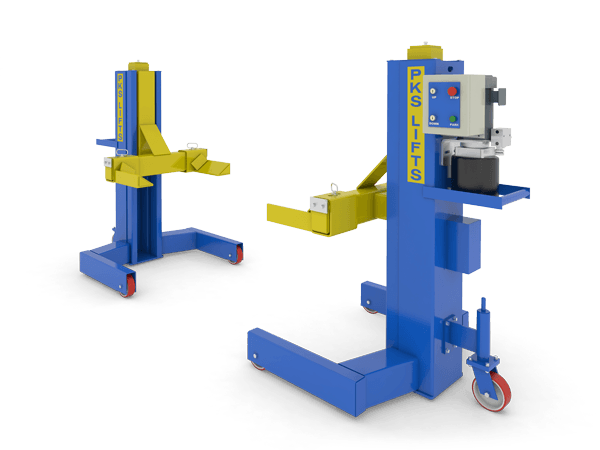 A Flexible, Mobile Lifting Solution For All Your Inspection And Service Needs. Engineered For Heavy Duty Platform Applications & Available In Multiple Configurations, Including Recessed Or Surface Mount Installations. Designed For Maximum Capacity And Productivity Offering Both Cassette Or Frame Style Installations With Moveable Or Stationary Posts. 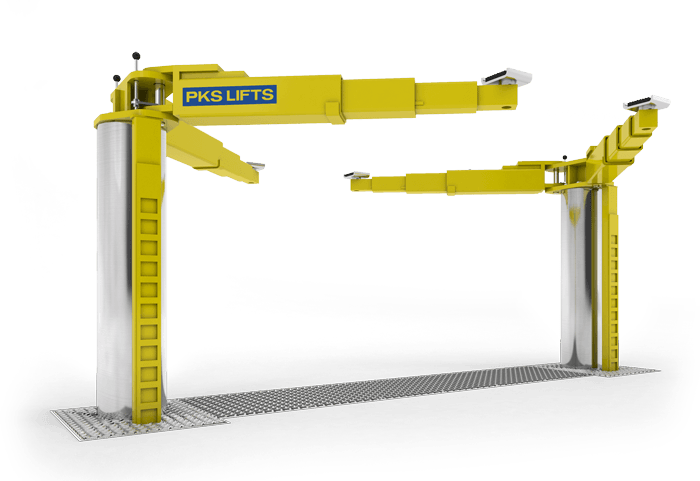 PKS leads the industry in custom design and engineering to meet all your lifting needs. With over 50 years of collective experience in the lift industry, PKS has built a reputation in manufacturing Heavy Duty Lifts. 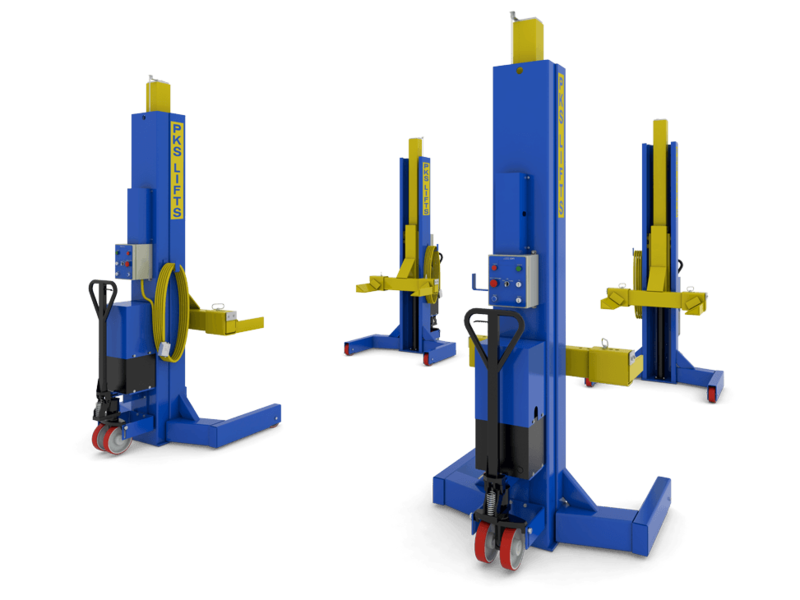 PKS is a leader in lift innovation and maintains a competitive edge by utilizing the latest technologies in lift automation controls and hydraulic fluid power. PKS is known for our quality workmanship, excellent customer service and our ability to design or customize any lift. PKS manufactures a wide variety of lifts, used in various sectors. 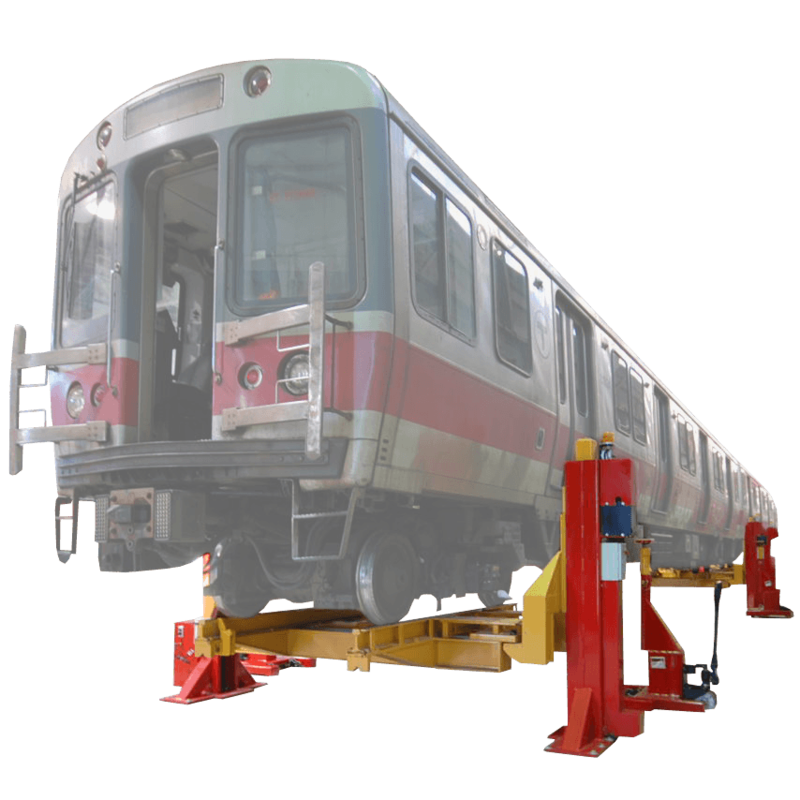 We build an assortment of automotive lifts ranging from small passenger vehicle lifts, city transit to Heavy Duty lifts used for industrial vehicle and machinery maintenance facilities. Our product line includes Heavy Duty 2-Post Lifts, Mobile Column Lifts, 4-Post Drive on Lifts, Scissor Lifts and In-Ground Lifts. PKS Equipment & Engineering utilizes leading edge CAD design systems to simulate our lift’s operation while still in the design state. Our products are tested under numerous temperature, pressure and structural stress conditions using current scientific methods ensuring quality and consistency throughout our product line. Our customer service and quality control departments constantly communicate with one another to assess customer feedback enabling us to continuously evolve in the automotive lift industry. 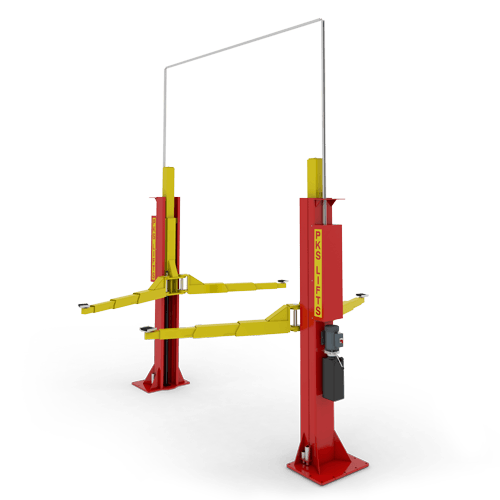 Everything PKS manufactures is built to the ANSI ALI-ALCTV-2011 Standard for Automotive Lifts Safety Requirements for Operation, Inspection and Maintenance. PKS is a member of the Automotive Lift Institute. The majority of our lifts have been tested and certified to meet and exceed the MET requirements for lift safety. ESA/CSA certified controls are available on request for any lift not currently certified. PKS is also registered as an ISO 9001:2015 company and we go through extensive yearly audits ensuring compliance. 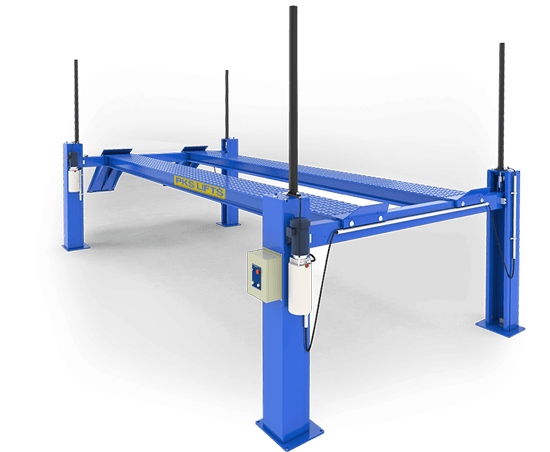 All of our lifts are made in Canada and are manufactured with US/CAN structural steel exceeding all current Automotive Lift Institute (ALI) Standards for vehicle lift construction testing and validation. We ensure the ISO 9001:2015 compliant quality process from start to finish. With over 50 years of collective experience in the lift industry and backed by our long list of satisfied customers we are so confident with the quality and durability of our lifts that we boast the best warranty in the lift industry. 1. Are they built to the latest ANSI/ALI-ALCTV Standards? Most people can just tell using their own intuition that there’s something not right about a lift they are looking at. That’s the quick feeling you get when you start to walk under something questionable and say to yourself “I don’t know about this”. You can have peace of mind if you see GOLD. Above all, if it is backed by the ALI Gold label you can be sure it was third-party tested to at least 1-½ times the capacity it says on the sticker. 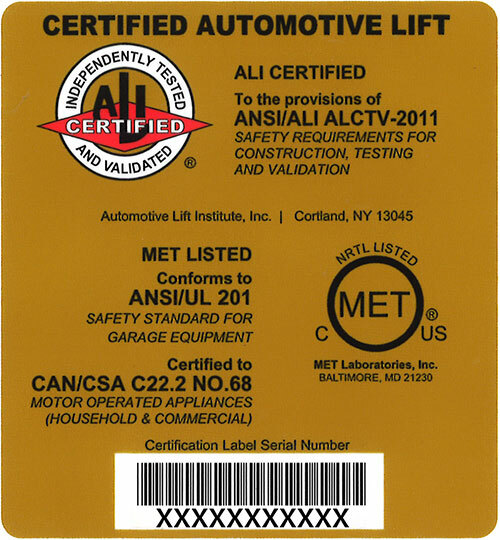 Next, it’s been certified to meet all the requirements for ANSI/ALI-ALCTV-2011, which is the American National Standard for safety requirement Automotive Lift Construction Testing and Validation. 2. Is the design structurally sound? Your employees work under these lifts all day and every day. Wouldn’t you want to have the comfort of knowing the lifts their using were built to follow stringent safety standards and backed and certified by third party testing? Yes, there are lifts out there that cannot lift what they say they can lift making it a safety hazard and a liability for you and your employees. At PKS we offer nothing but quality, safety and heavy duty lifting. Are the columns made of sturdy forklift mast channel with bearings or is the column made of thinly formed metal channels? Is the carriage made with thick tubes and gussets? Do they use load-bearing wire-ropes that stretch over time, or is it a direct drive cylinder system? 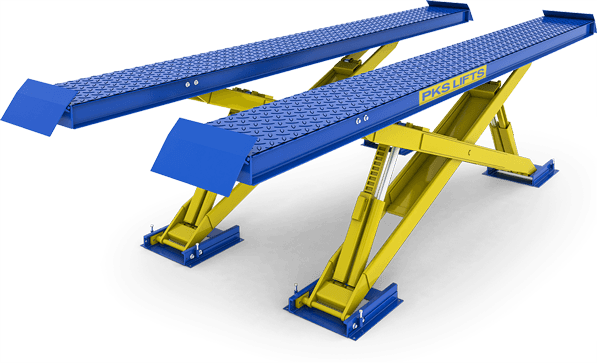 Does the lift system have components that have the potential to wear such as chains, gears, screw-style drive systems, bushings, etc? OR does the lift have bearings, guide blocks and direct drive pistons? And finally… You can tell a company is confident in their product by the warranty they provide. PKS offers a 25-year structural warranty in conjunction with a lifetime warranty on Carriage Rollers Bearings. 3. Where was this lift manufactured? B. If you needed parts, support and even service, then having a manufacturer with local distribution networks will cut costs, alleviate downtimes and provide you and your customers with peace of mind? How long does it take for parts to get to you from overseas? You don’t run into that problem with local manufacturers. We provide expert training, overnight parts and live tech support. C. The price of a shipping a container overseas is based on weight, so the more lifts you can pack into a container the better, what is that doing to the quality of the lift… Bare minimum design, bare minimum steel, bare minimum safety systems, plain and simple.